Registration for the Jelly Roll Race has been very slow, possibly due to the holiday weekend or other conflicts. We will be looking to reschedule this or another event to benefit Quilts for Kids in January/February. Thank you to those who have pledged support! The national QFK office has approved and returned our first quilt (made by Sonja W) with a congratulations letter for the chapter! The classroom is open this Saturday, call the store if you would like to have a QFK workshop. Winter Hours - We will be changing store hours on Fridays only - closing at 4:00 on Friday and Saturday through the winter. We will continue to be open 10:00 - 5:30 Monday through Thursday. Stitcher's Quest will be closed November 21-27 for Thanksgiving Week - but don't miss our Open House and SPECIAL SALES on November 20! Learn to make these quick and easy zippered see-through pouches! They have so many uses! Tuesday, December 6 5:30 - 8:00 p.m.
Quilted Sweatshirt Jacket - These jackets are fun and cozy! And so easy to make once you have had a lesson from Tracey! 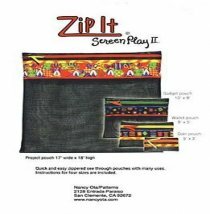 This is a 2-part class: Monday, December 5 and Thursday, December 8 5:30-8 p.m.
You'll have great fun making this bag, the first of several that Carol will be teaching from the book: Perfect Patchwork Bags.